Welcome to summer camp for detectives! The kids can’t wait to spend a week following clues and learning about the science of crime solving. Soon all the campers are working on a mystery. 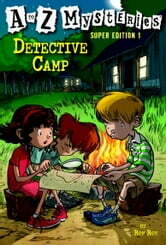 But while Dink, Josh, and Ruth Rose are figuring out their part of the puzzle, they stumble onto something suspicious. Could a real crime be happening at detective camp? My Weird School Daze #4: Coach Hyatt Is a Riot! My Weird School Daze #1: Mrs. Dole Is Out of Control! Capital Mysteries #1: Who Cloned the President?